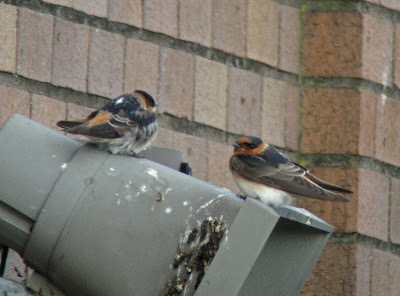 This Cave Swallow phenomenon continues to amaze me; the novelty has not worn off on this birder! This has been the largest [geographical] invasion yet, with birds reaching as far northeast as Newfoundland. Five years ago this was a major rarity in Connecticut. Now, the question is not 'will there be Caves this year? ', but 'how many will there be?' Simply amazing. I'm not quite sure how this sort of explosion can happen so rapidly....heck, it wasn't even long ago that Cave Swallow was still considered rare at Cape May. The prospect of seeing a Cave Swallow in CT still gets my blood pumping. 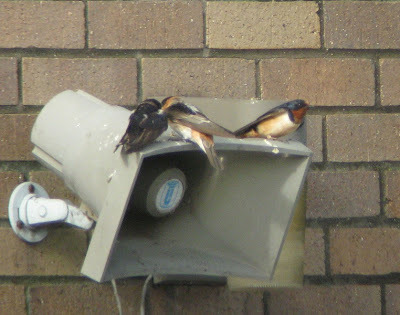 Despite fully expecting to see one (or more) today, I could not help but yell out "CAVE SWALLOW!" in nervous excitement when the first one passed through Lighthouse Point this morning. 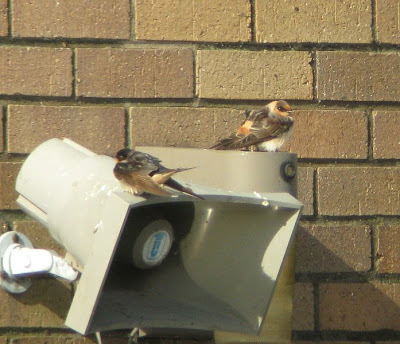 So, I started at Lighthouse Point with two goals: 1) see Cave Swallow, 2) photograph Cave Swallow. In a matter of minutes two Caves raced through the park at a distance. Objective #1...check! I got on a third Cave Swallow, also at a distance, which I was able to photograph in the form of a blurry silhouette. But that wasn't good enough for a photo and I was still looking for a decent view. 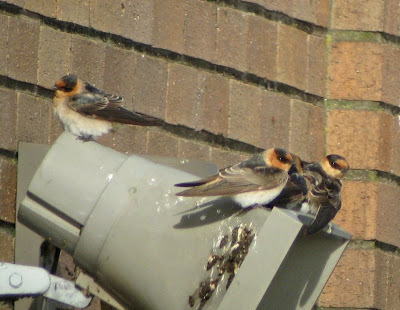 Several minutes passed without another swallow when Mark Aaronson strolled up to the hawkwatch, casually mentioning that there were a couple dozen (!) 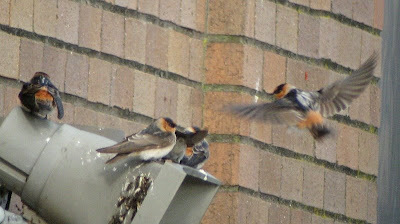 Cave Swallows feeding at East Shore Park! I was on my way. Just five minutes later I was looking at a swarm of Caves feeding low over the sewage treatment plant adjacent to the park. I stood there in awe for a few seconds, just letting it sink in that I was watching a large flock of Cave Swallows in Connecticut. Several other birders arrived and we estimated the flock at ~20 birds; three Barn Swallows were also taking advantage of the buggy sewage ponds. 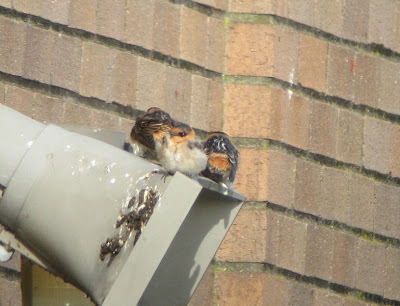 No sign of other swallow species. 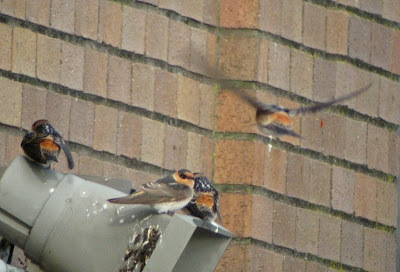 At about noon the flock all of a sudden vanished, leaving only the 3 Barn Swallows behind. After a few minutes of waiting, a single Cave Swallow returned (or maybe it was a new bird arriving...no doubt there were dozens of Cave Swallows in Connecticut today). One Cave flanked on each side by a Barn Swallow. 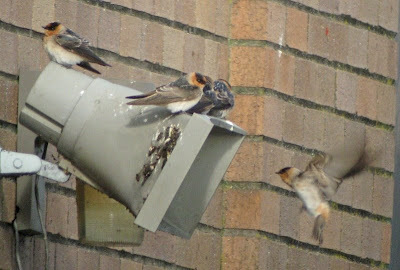 Cool Pic's of the Swallows - we had a good number today but not a single picture to show for it. Would be interested on your thoughts on the possible 'gambelii' when I post the pictures. Tnext question is when will they be taken off the CT review list? LA is thinking about it. I think they are now more abundant annually in cT than in LA eventhough they may breed and have bred down here.